Thanks for visiting my website. A professional stage, film and television actor for over 30 years, I am enjoying this opportunity to live my dream! In recent years I have seen new opportunities every day, and I now enjoy the chance to do more work across the country, as well as in my home state of Texas, Los Angeles and my beloved New Orleans. To check out what's been keeping me so busy, please click on my resumes, demos and project clips on this website. While I always tell my friends and colleagues that I am an ACTOR first - that is my passion - I embrace occasional opportunities to do more teaching and coaching in Dallas and also in Los Angeles. I have taught acting for over 40 years, beginning with recreation centers and Casa Manana Playhouse in the 1970s. My roots were in live theatre training and performance (prior to falling in love with film and television!) I cherish the roles I've been able to bring to live audiences over the years, both in musicals and straight plays. Also, a zillion years ago (it seems, anyway) I was a recording artist on the Dot Label with a couple of top 10 hits in various markets across the country. (#1 in Abilene TX for FIVE WEEKS!). We've recently uploaded four of my songs from the late 1960s and you can hear them on this site. It's really a hoot to hear these throw-backs to another era! Click on "Sharon's Audio" and check it out! I'm always balancing a number of exciting new projects! More on the newest ones later. I stay involved as much as possible in the local Dallas industry as 3rd Vice President of our DFW SAG-AFTRA Local as chair of the ProACT Conservatory Committee. (More info coming soon on this site as well as through the SAG-AFTRA website!) 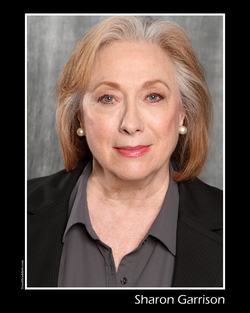 I appreciate all of my patient and supportive friends and colleagues who have helped me grow and prosper in a professional acting career, especially the great opportunities given me by my terrific agents: Linda McAlister Talent in Dallas, the Southwest and Los Angeles and Landrum Arts LA in Louisiana and throughout the Southeast. VELVET RIBBON ENTERTAINMENT is my production company begun by my husband, Bill Mervis, and I in 2011, as we undertook producing our very first short film, THE PAINTED WOMAN, written by William Bienes. The gratitude we both feel for those fabulous partners who traveled that adventure with us is beyond words. What an experience! Our modest little company has since been involved in producing several award-winning short films. We look forward to more of those, plus a feature film project soon! Thank you for visiting my site! Please stop by again soon and say hello! Sharon I was inspired by your self taping video on you tube and have since taken an online class in it and have self taught myself how to tape auditions. Thanks for your inspiration in the need to be versatile and travel some for opportunities. I never knew the history of your song "Nobody Likes it but Us". My brother and his first wife lived this song while secretly dating in Ft. Worth, TX. They went to Pascal High. She from a rich family and my brother from a middle class. I used to help him sneak out of the house in the middle of the night! I will never forget when I first met Sharon...she thought she knew me from years past of theatrical productions and film and TV. I think she really meant she knew me from the future, for we since have worked together on staged readings, short films and many special events together. This woman is not only a brilliant actress, but a talented and life-inspiring mentor I am honored to know from that first day forward! Cait and I cannot thank you enough. Your excellence splashed onto my daughter during your tapings together, evidence in the results. Yes, you did a terrific job taping her, but your genius while teaching and guiding her through the scenes were priceless. Wish we lived next door! Out in L.A./Hollywood but getting a bit too pricey again and very homesick for Texas again. I'm a native of Dallas and look forward to having an audition self taped at your studio. Looks like a great learning experience as well. I read about an actor recently who self taped on his I-phone from France and was booked on the spot for a major studio film. Might want to learn the Skype taping etc. How much do you charge to learn some of this long distance for now? Call or email anytime. I like Drop Dead Divas, will watch for you. 323-459-9182 or Jean2it@gmail.com also on IMDB etc. So nice meeting you at SAG Life Raft last night. I am looking into coming down to NOLA in next few months& definitely want to work with u. Will be in touch. Hi Sharon! Thank you for that informative live stream on Self-taped auditions. I am so happy I caught it! You mentioned that you might be in New Orleans soon, if so please give me a jingle (818) 497-4867. I would love to meet you and take your class on Self-Taped Auditions. Sharon's passion for her craft goes hand in hand with a solid work ethic and unquestionable integrity. Boundless creativity meets professionalism that is beyond reproach with Sharon Garrison. Love your website, looking forward to seeing more of your work.